Inveraray Estate, Garden Bridge over River Aray. General view. 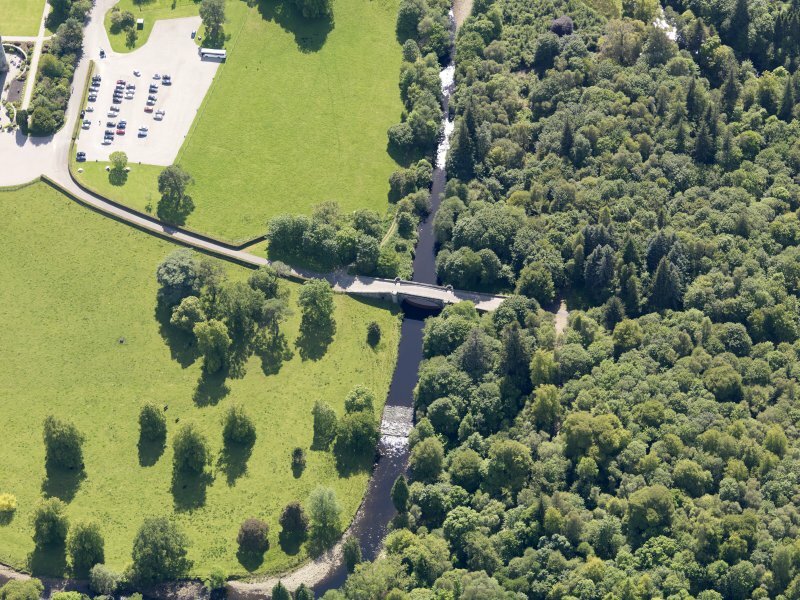 Oblique aerial view of Inveraray Castle garden bridge, taken from the W.
Oblique aerial view of Inveraray Castle garden bridge, taken from the NE. Descheduled: formerly scheduled as Inverary, Garden or Frew's Bridge. 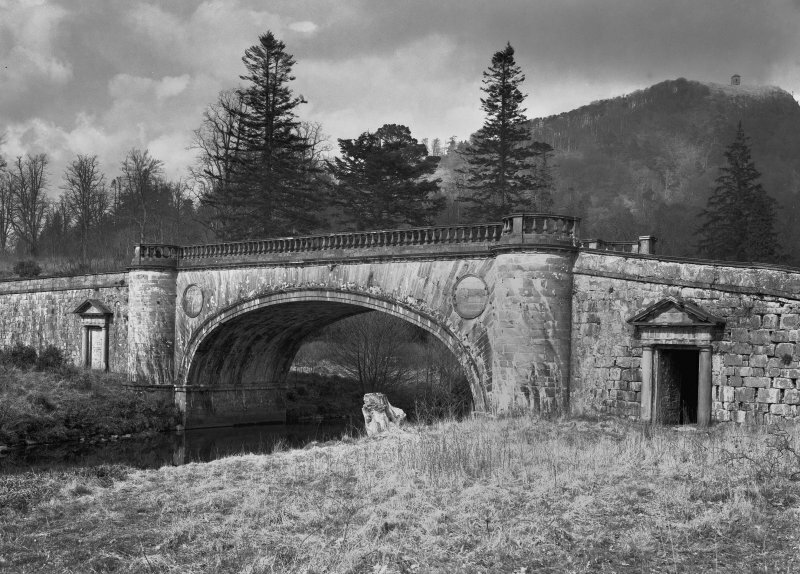 This bridge carries an estate road across the River Aray about 250m NNW of Inveraray Castle (NN00NE 15). W.Schomberg Scott Photograph Collection. Acc. No. 1997/39. 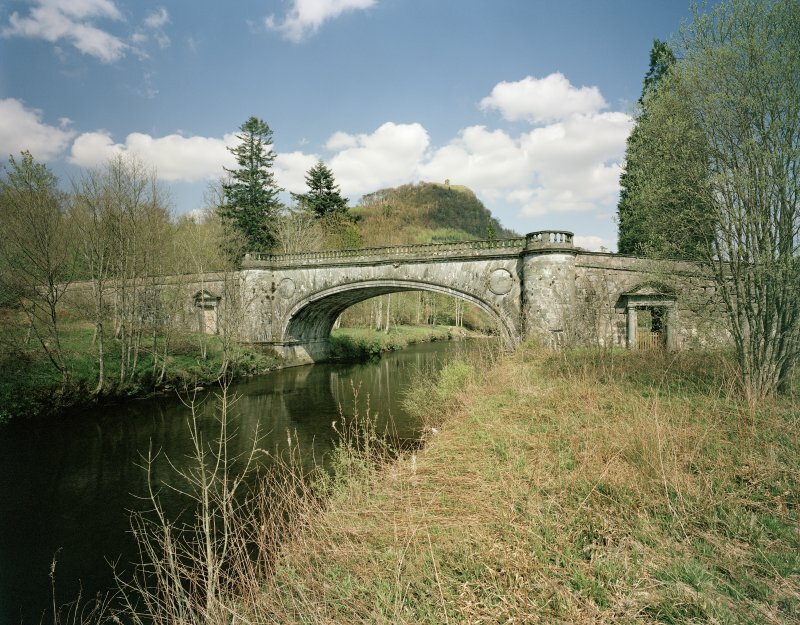 This bridge spans the River Aray 250m NNW of Inveraray Castle (No. 184), on a vista extending NW from the site of the old castle (No. 132), along an early 18th-century avenue to the Carloonan dovecot (No. 189). 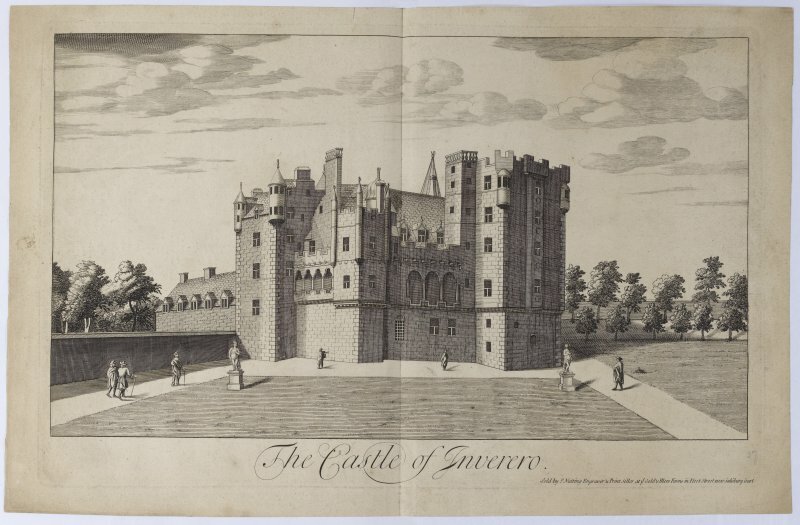 It was first proposed in 1756, and two years later John Adam was commissioned to produce a design and the contract was awarded to David Frew, an Edinburgh mason by whose name the bridge is sometimes known (en.1*). 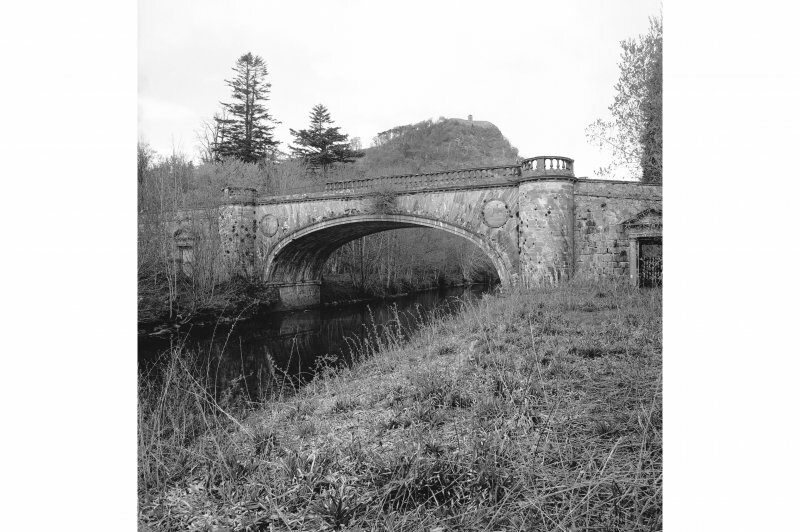 The bridge is of classical design with an elliptical arch of 18.2m (60 feet) span, although the first proposal by Adam was for a battlemented parapet with higher abutment-turrets like those of his 'King's Bridge' (see No. 255), and an early drawing shows a segmental arch, with alternative forms of abutment (en.2*). It measures 27m long by 7.4m wide, and the heights above water-level are 6.6m to the arch-soffit and 9.5mto the parapet. The overall length is 82m, including inclined approaches of which that to the SE is shorter and steeper. Their converging walls terminate at the outer ends in square pedestals which formerly carried urn- finials, and the retaining-walls are of roughly squared and coursed granite with a massive, slightly peaked, moulded coping of schist, and a plain schist band 0.7m below the coping. The bridge itself is of diagonally-tooled chlorite-schist ashlar from St Catherines (No. 248), but polished ashlar is used in the arch-mouldings, the cornice and balustrade, and in the moulded surrounds and horizontally-coursed filling of the two 1.7m roundels occupying the arch-spandrels. 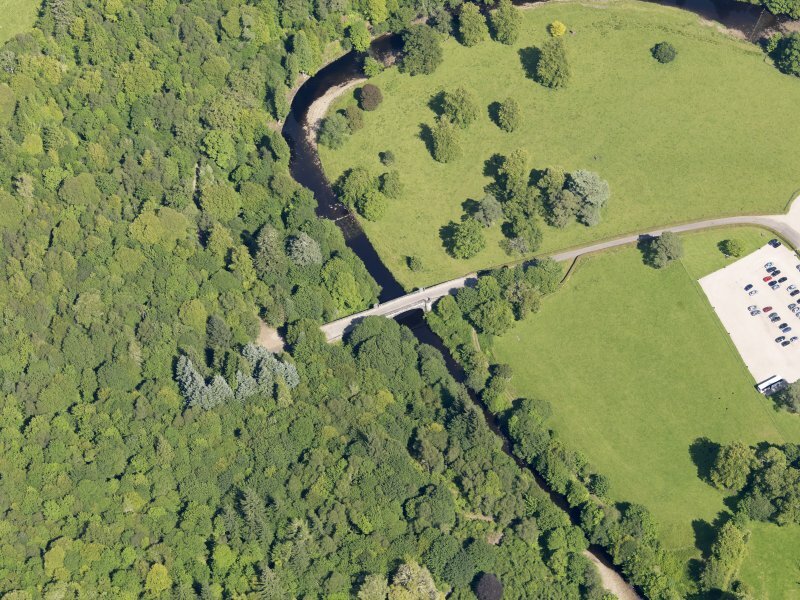 The abutments are marked by semicircular projections carrying refuges, with cavetto-moulded base-courses which continue to form the springing-courses of the arch. This is framed by two plain orders within a quarter-round moulding, and the jointing of the voussoirs, although of varying thickness, is continued on the radiating ashlar slabs of the spandrels, as in Morris's Garron Bridge (No. 267). The moulded cornice is carried on a series of shaped corbels and itself supports a balustrade with moulded coping, and these features are continued round the refuges in the abutments. Each of these has a stone bench, and they originally carried urn-finials, shown on Adam's drawings, whose seatings survive on the square central and end-pillars of the parapets of the refuges. The approaches are pierced by passages entered by Roman Doric porticoes set at the level of the base-course of the arch and abutments. They are of chlorite-schist ashlar, and have circular columns with moulded capitals carrying entablatures with fluted triglyphs and guttae, and pediments with modillions below and within. Each of the passages contains two opposed half-vaulted semicircular recesses with stone benches, and in each passage the SE recess has been contracted with brick walls (en.3*). John Adam, architect; David Frew, mason; 1758-62. Situated midway along N side of the 17th century garden, linked new castle to older 'oak walk'. Information from ‘RCAHMS Excursion guide 1990: Commissioners' field excursion, Argyll, 7-9 May 1990’.